The first state level orange festival was held at remote Karbook subdivision in southern Tripura on Friday. It was organized to encourage farmers of Killa in southern Tripura in orange cultivation. Chief Minister Biplab Kumar Deb, Agriculture and Tourism Minister Pranajit Singha Roy along with few other MLAs, high officials of the Horticulture department and other dignitaries took part in the orange festival. 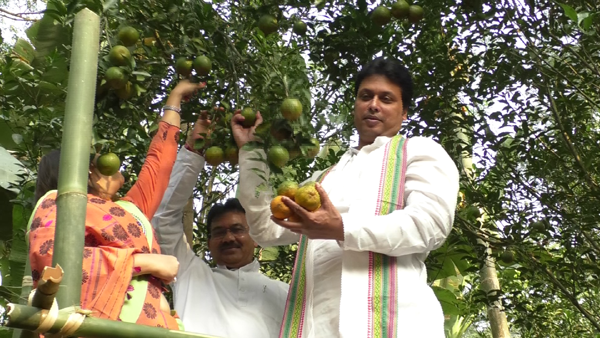 Biplab Deb and his wife also visited a recently planted orchard and tasted the fresh harvest. He also assured all help to the farming class besides the state government grant of Rs 15000 per hector of orange cultivation area to encourage farmers towards orange cultivation. Deb also inaugurated the orange festival and visited the various stalls where the farmers had displayed their orchard’s produce which had huge demand. The farmers and visitors both expressed that they were happy that the orange festival was organized where there was direct interaction between the farmers and consumers and moreover, the ocassion also played a significant role in bringing closer the tribal and non-tribal section of people of Tripura. Oranges of Tripura’s Jampui hill are some of the best in India but due to lack of proper monitoring and care the orchards are in a pathetic condition and production has drastically gone down.